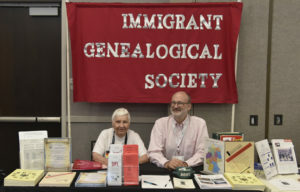 Immigrant Genealogical Society | Immigrant Genealogical Society (IGS) helps Americans trace their ancestors' origins, particularly in the German speaking areas of Europe and the places in the world to which they migrated. 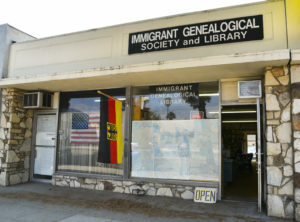 The Immigrant Genealogical Society (IGS) was founded in 1982 to help Americans trace their ancestors’ origins, particularly in the German speaking areas of Europe and the places in the world to which they migrated. The society maintains a genealogical research library, publishes a newsletter and two periodical journals, and offers searches of its holdings for users worldwide. The Immigrant Library serves as the IGS headquarters and houses a collection of materials related to German and American genealogy. The collection began with the extensive personal libraries of Elisabeth Sharp and Gerda Haffner. The collection has grown over the years as society members and others contributed their materials and money to the library. Presently, about half of the library holdings cover German speaking areas of Europe and half cover America. More. 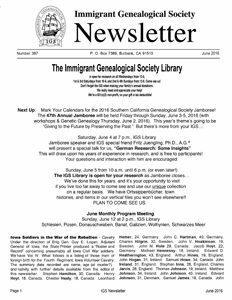 The IGS Newsletter – produced monthly, contains brief but useful news items related to genealogical research as well as references to other resources. Die Pommerschen Leute – produced quarterly, is a genealogical resource for descendants of the Baltic Duchy of Pomerania. German-American Genealogy – produced at least annually, contains articles related to the migration of Germanic peoples to America. Volunteers make the information in the Immigrant Library available to researchers who are not able to use the library’s resources in person. For a small donation, they will use their experience with each resource to locate data of interest, make copies and forward the information to you. More. Invites genealogists to speak at general meetings of the IGS held on the second Sunday of each month. Maintains the Immigrant Library for public use. Publishes the German-American Genealogy twice a year. Sponsors the Pomeranian Special Interest Group (PSIG) who publish Die Pommerschen Leute. Holds classes that teach the basics of American and German genealogy. The Immigrant Genealogical Society is, since December 1985, an IRS recognized 501(c)(3) organization. Donations of cash and books are tax-deductible. Cash donations for the purchase of library materials and supplies are always welcomed.